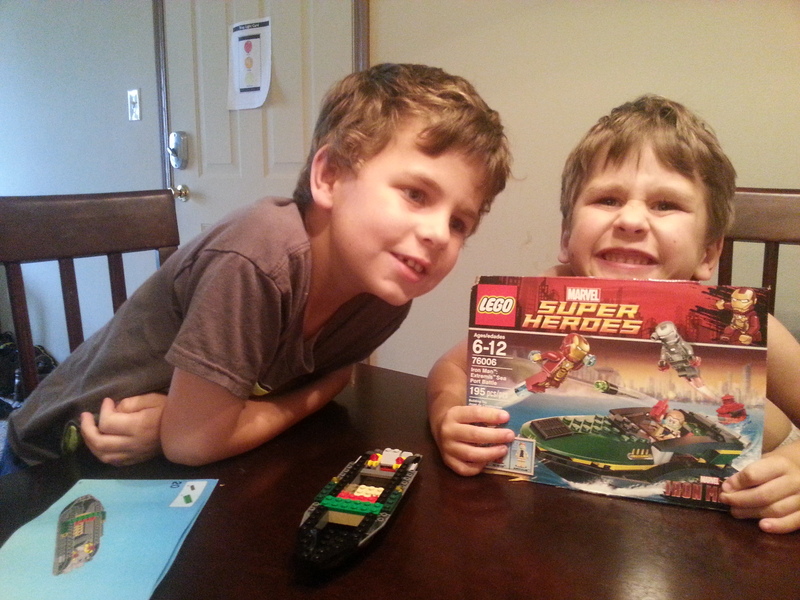 Normally Daddy does Lego kits with the boys, but this time Momma proved she can do them too. I am not a huge fan, i feel the pop apart to easy for ME, it is almost setting the boys up to fail. Nevertheless the boys like them and spend their money on then and choose them as prizes to earn. So be it. 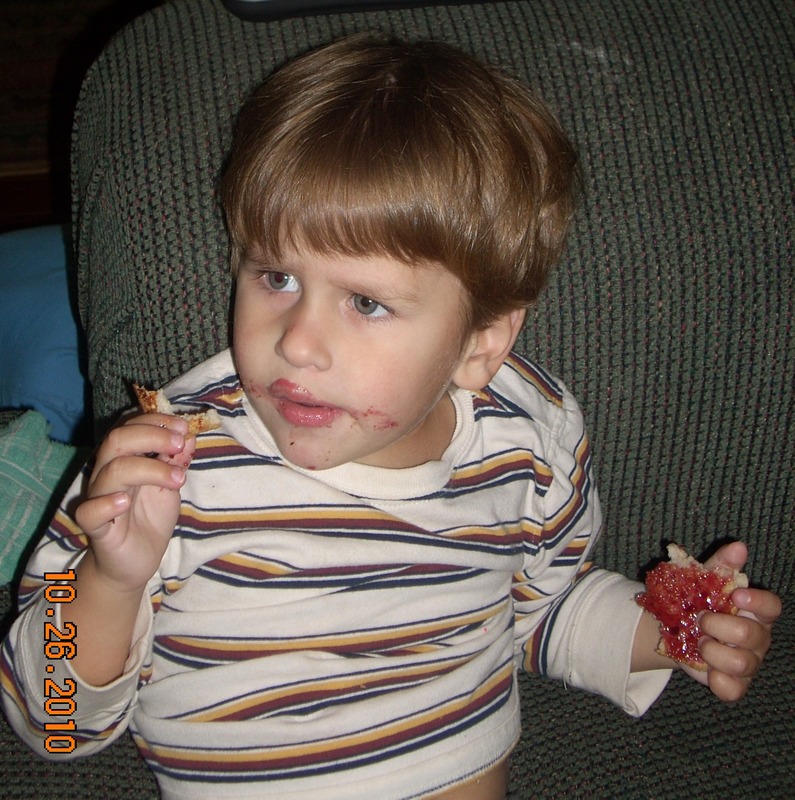 Boys and worms is there any love more true or predictable? The boys love worms and worms are very useful we drown many of them in efforts to catch fish, we watch them, we put them in the compost, and in the garden. I decided, in the name of science, to make the boy a worm farm. 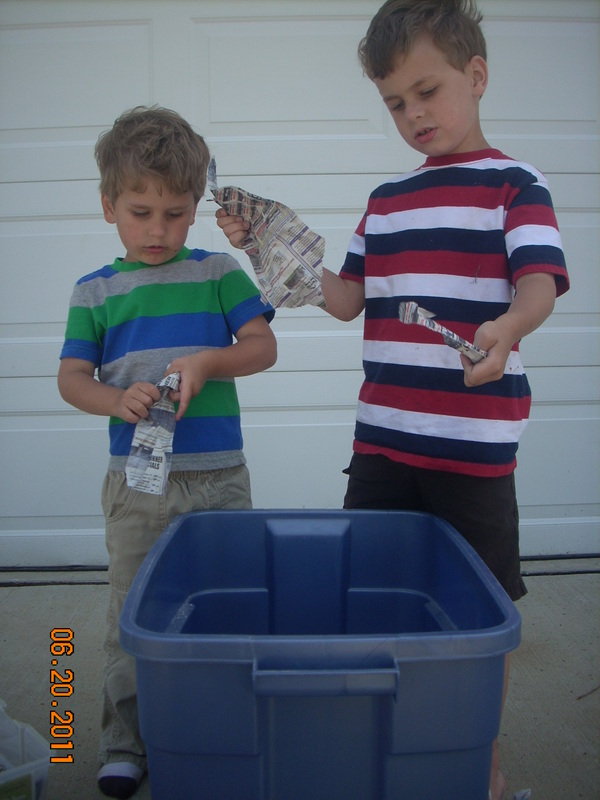 Ok to make a worm farm with the boys, but let’s be realistic, Momma is making the worm farm. Aware I could make a worm farm in a big Rubbermaid tubbie bedded with newspaper I set of to search the Net for a bit more specific directions. Interesting worm trivia: Earth worms have no lungs or gills. They breathe through their skin. Eggs are laid in a cuff-like structure called the clitellum. Each earth worm segment or annulus except the first and last has four pairs of tiny bristles called setae. Earthworms range in size from 1 millimeter to 3 meters long! The basics. (also a great science site for other ideas and activities, we’ll be returning here). Many sites (like http://www.deq.louisiana.gov/portal/default.aspx?tabid=2101) suggest NOT using night crawlers, but we are going to. Nevertheless, it seems to me that just as many sites suggest using them, since you can buy them with ease at any bait shop. I bought some today at our local bait shop, as I have before to add to the compost pile. At planetkids.biz we focus on making the complex issues understandable. Here you can find a range of clear, colourful, humorous and accurate resources to help everyone understand the major environmental challenges we face. I have not read the entire site, but I do like the clear and easy style in which the projects are presented. The directions are to / for the children, but are not dumbed down to the point they are silly. I found them great. Worms brought home after our trip to the post office I discussed the plan with the boys. We took an older tubbie that still had a top, but a top that was warped and did not fit great. Daddy pitched in by drilling holes in the lid and around the top of the tubbie itself. Air movement is important. The boys and I shredded newspaper for the bedding. 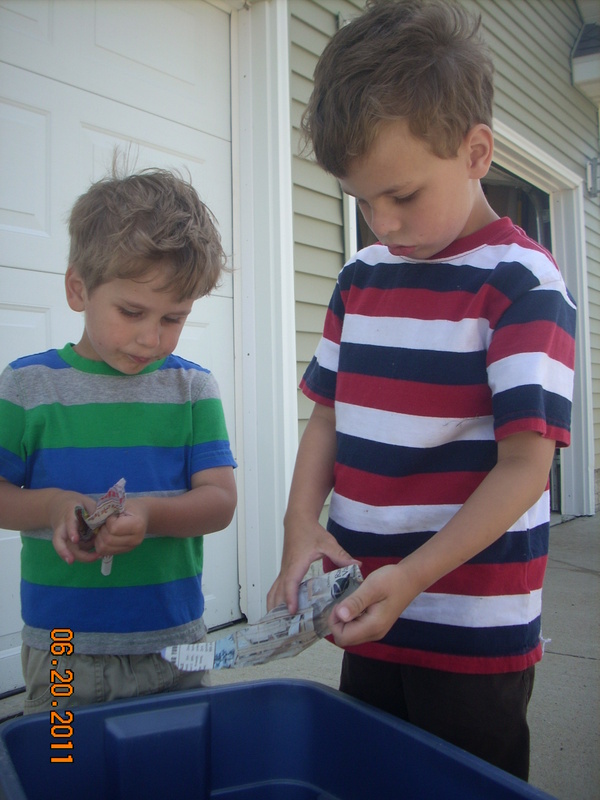 Shredding newspaper is a great fine motor skill practice (shhh). It builds strength and control. I was, frankly, amazed how much trouble the boys both had with actually gripping paper in thumbs and first fingers and tearing it, not just pulling at it. I admit Momma shredded most of it; but Big Brother sat with me a long time and worked hard. 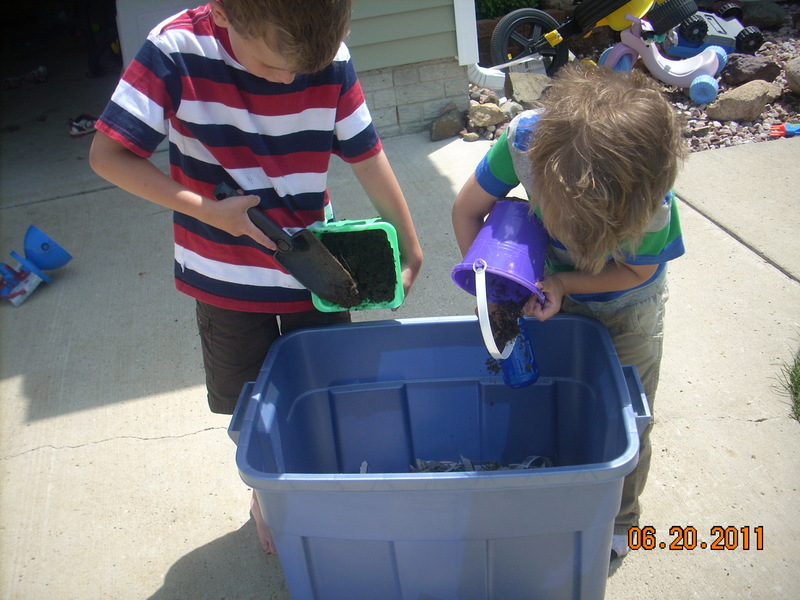 After the paper we filled two small pails with dirt from the garden and poured that in. Momma got the job of hosing the mix until “moistened so it is as wet as a wrung out sponge”. Both boys really really really desired THAT job!! But the point is not a swimming pool for worms. After that we dumped in the worms!! At the point the worms got added, more bedding was needed but I chose to go on and add the worms while the boys were still interested; adding additional bedding later. The lucky pioneers. The startes!!! Little Brother poking at the starters. For families that do not live on 33 acres, do not have need for a full farm, nor space for it; or for parents that really can’t get into making and maintaining a full farm: http://www.ehow.com/how_4865624_make-worm-farm-kids.html is a great idea on how to do a small short term farm for observation with out the full commitment. Might be a good options for a family in an apartment ort small house in the ‘burbs. http://quazen.com/kids-and-teens/entertainment/how-to-make-a-worm-farm-in-a-plastic-bottle/ is the same idea, but I think the first link does a better job of explaining it. I am thinking of doing this, too, because they boys would be able to see the worms more, and see the tunnels and so on – more of an observation opportunity. 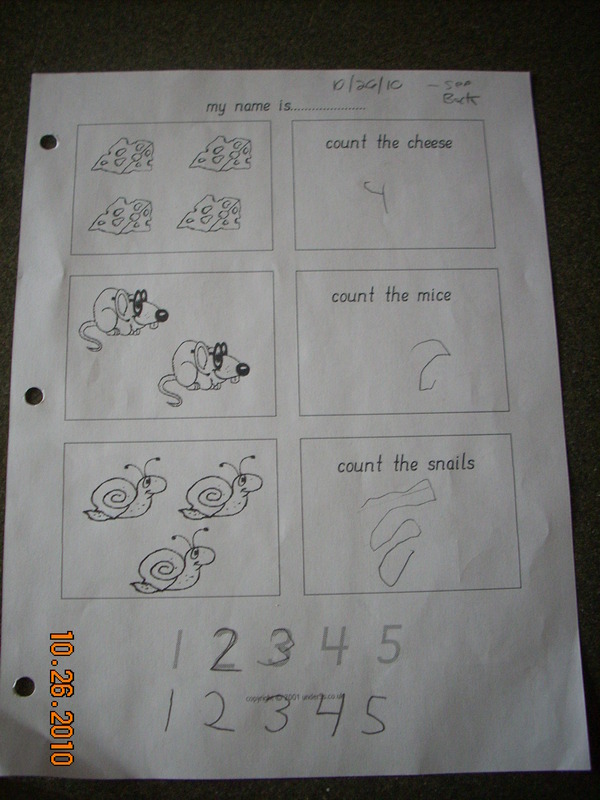 The boys worked on numeral order; that is putting printed numerals in order and counting “up one” and “down one”. They got to go 20 questions on the computer, ok Big got to standing by me and Little, hanging over my should got to shout out the numbers he knows, indifferent to the actual question, and point a lot. All I can say is you have to be physically strong to home school a preschooler and a kindy kid – I wanna be the mom fro the Incredibles!! After the computer time we got out the number tiles and I gave Big Brother the 1 to 10 tile and told him to put them in numbered order. 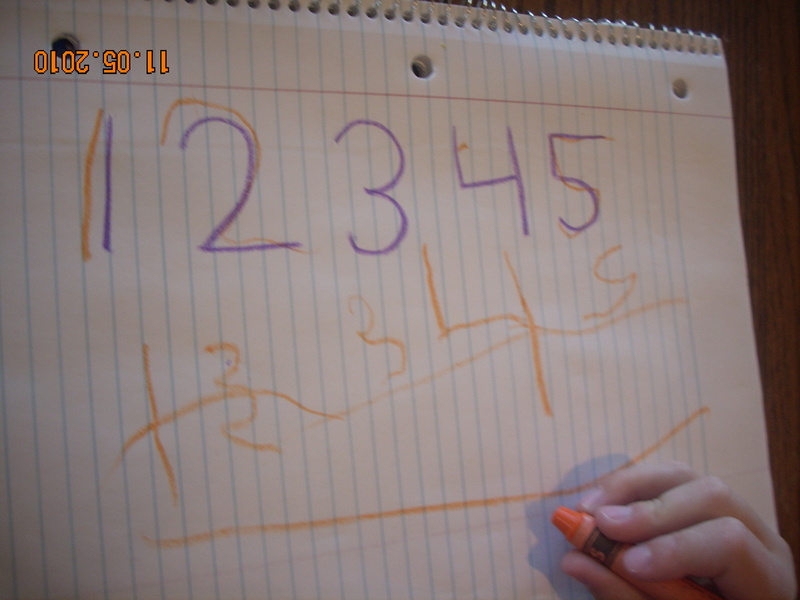 He can count much higher; but as for recognizes the written numeral; he struggles at 8 and above. Our current goal is to count, and identify numbers up to 100 with ease. 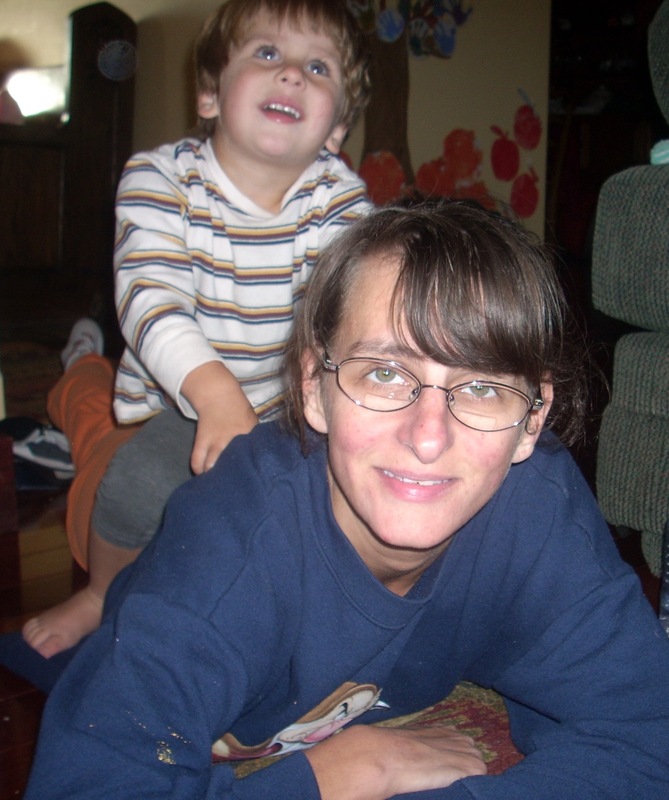 Home schooling is even more fun, not only with a little brother to help you, but a puppy too. Both boys worked on fine motor skills today with a set of lacing boards. Stop sign, square, pizza slice, so on that they lace the edges with shoelaces. Ok maybe it is just my kids, but these do not keep their attention for over 45 seconds. I can’t even tell you if the task is a challenge for them, or super easy – they won’t stay at it. They start to lace, then they are swinging the cards by the lacing string (so, of course, Momma has to take it away) or “fishing” with them or ….you see the trend, they are not lacing. So the cards got taken away after about 3 minutes after Momma had to stop them being swung and used for tug-of-war. This is honestly the challenge I run into with most “fine motor practice” they start misusing the item almost immediately (bead got tossed, or rolled; tweezers or tongs pinch people, and so on). 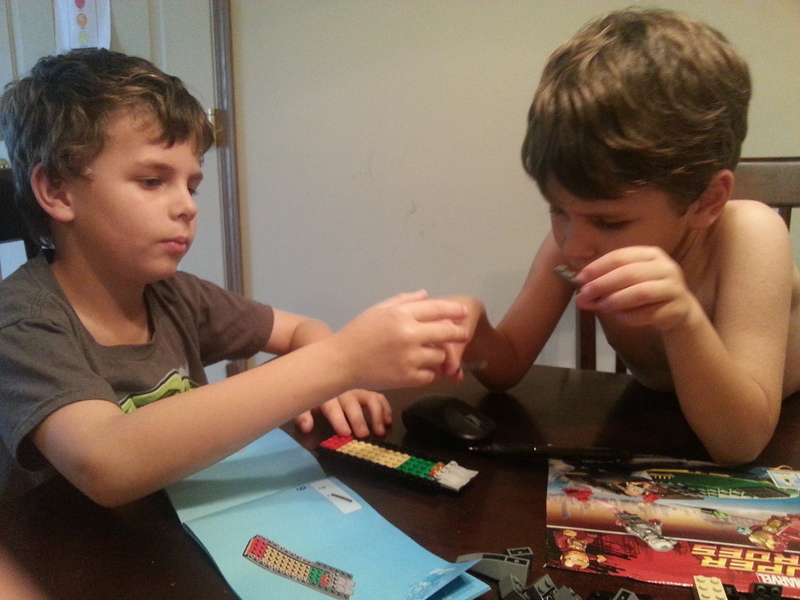 I am not sure if this behavior is due to them just being little boys (all BOY boys at that) and so close in age they constantly egg each other on; or if it is a avoidance behavior because the request (the fine motor activity) is a challenge or frustrating for them. Boys had a great day. Lots of appointments, lots of waiting and still had a great day. I used the new handwriting worksheet generator to make some sheets for Big Brother today – just his name. I wanted to see them actually printed off, and that is the real reason I did them today and not next week. Big Bother seemed really excited to see them, he pointed out the arrows that direct the lines even. I did the biggest size possible and I think it is still going to be a struggle for him, but there is no rush and no pressure. 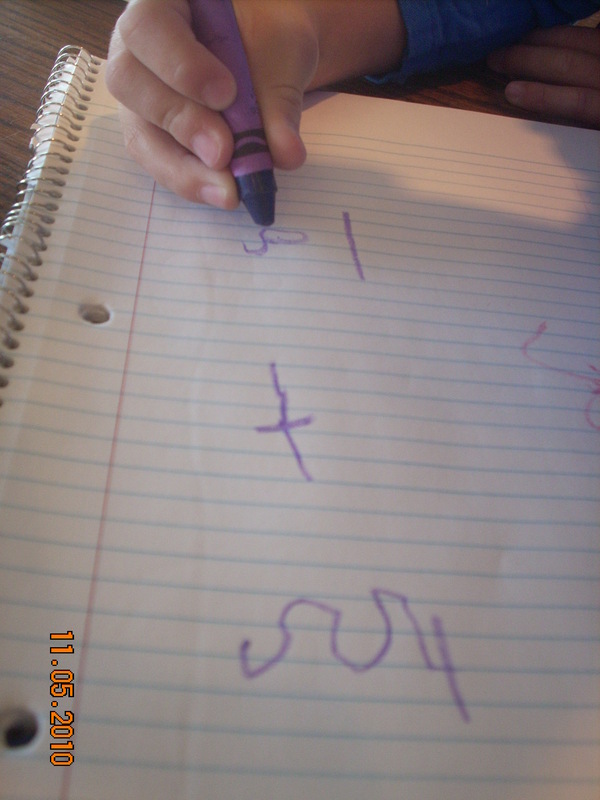 Handwriting is something he is asking for, he wants to write messages and send letters and make lists, so he is anxious to be able to write. 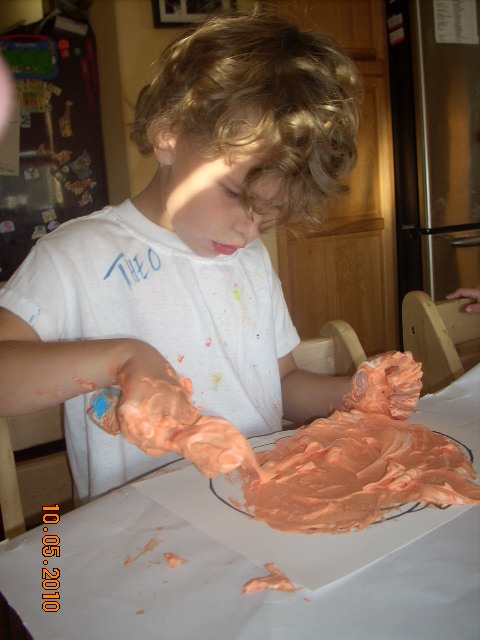 We are working more and more on fine motor control and endurance. 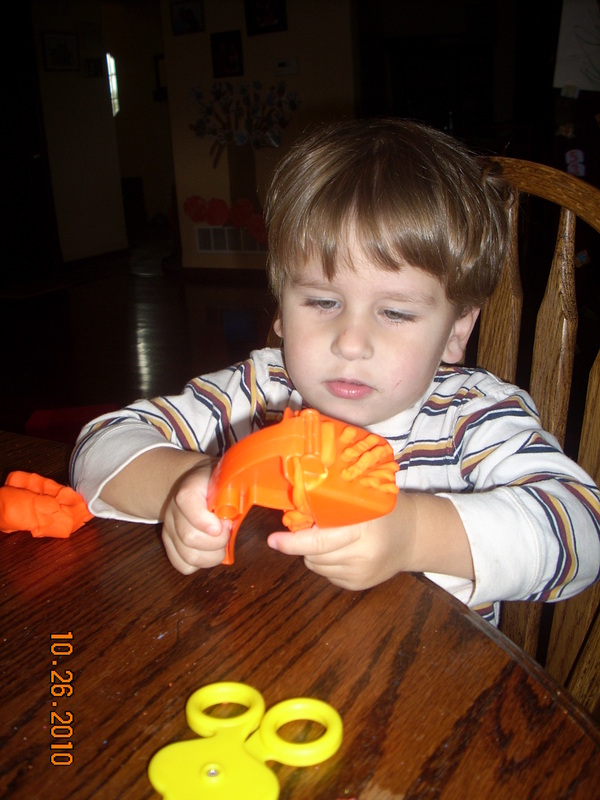 One skill / area we are struggling with is hand strength and the ability to manipulate items in his hands. Think having a penny in your palm (flat in the middle) and rolling it up ti a pincher grip to put in a coin slot. He can kinda do it, if he turns his hand and uses gravity too, but he can’t really do it well. 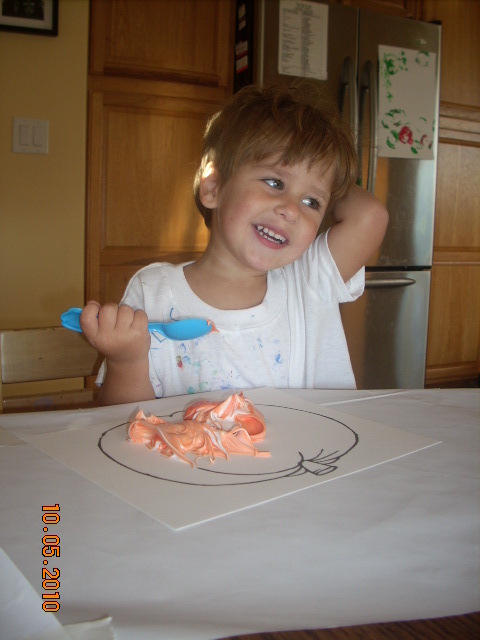 To help with that, at the suggestion of the school OT therapist I just ordered these flip crayons. Yes, I realize the are made to go with handwriting without tears that I don’t like. LOL But they are a tool, I am good with a variety of tools, just not over the top programs (and I still do not like the ball and stick font). 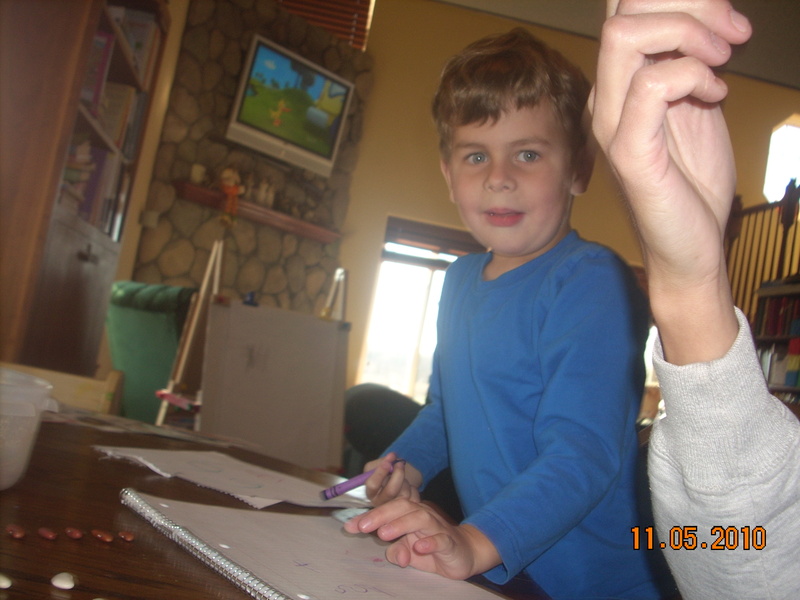 The goal is for him to switch colors, manipulating the crayon in one hand. I have some other games for us too, keep watching. Another way to describe the positive side of this “30-Day Encouragement Challenge” is by using the word “edify,” which means, “to build up.” Negative comments only discourage and tear down. Positive comments encourage and build. Do you edify your husband before others, adding to his value in their eyes? This is especially important to other family members. I have been trolling other blogs, finding several really cool art projects. I am really noticing, at least in the pre-k and k years, there is a lot of ART out there. “Fitting it in” (I really have to wonder how many home schooling families of younger students are MISSING art?) and ideas and oads to the impo rtance of the process and not the piece itself and so on. However, you find a lot less publicly encouraging parents to engage in math, science or even reading and phonics. I guess I too have been guilty of this; art is easy. That being said, I scrubbed art from today’s list. I have had a head ache all day and Little is in a cuddle mood; I saw no reason to push it. Monday is soon enough, or anytime. Math today. 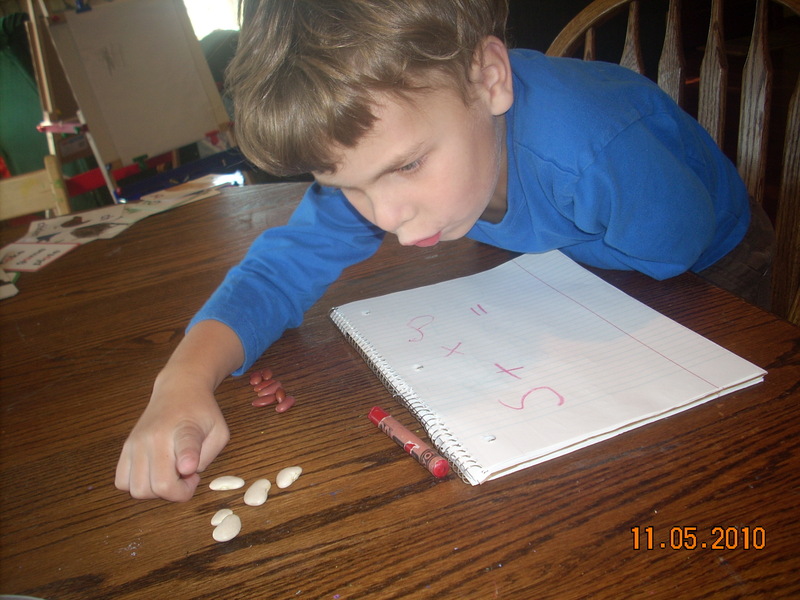 I broke out a bag of large Lima Beans and a bag of red Kidney Beans and we practiced making math facts. I let Big Brother choose a small number of beans from one bowl and the other. We’d count the first pile, write that number, then count the other and write that number, then “add them” and write the answer. 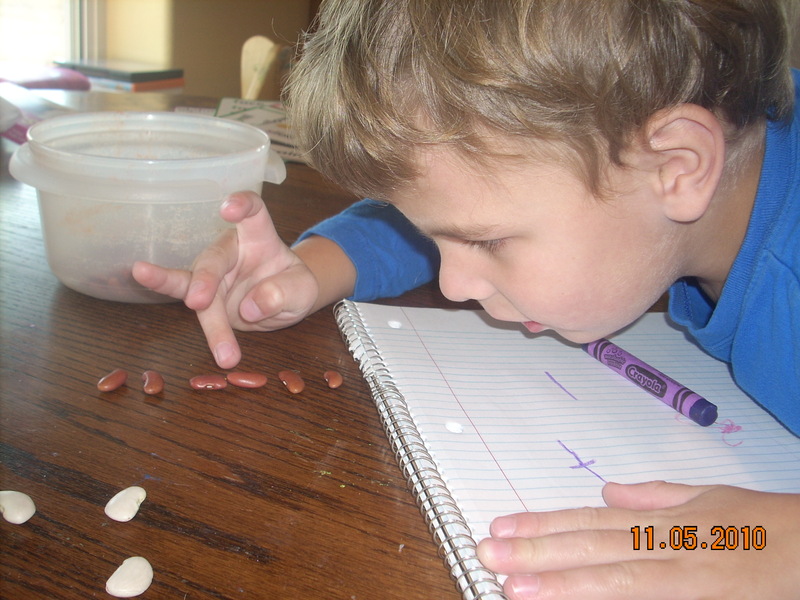 We only did a few; the beans are an enticement to Little Brother and Big Brother was more into the writing than the manipulative counting, so we moved on to practice writing the numerals 1 to 5. 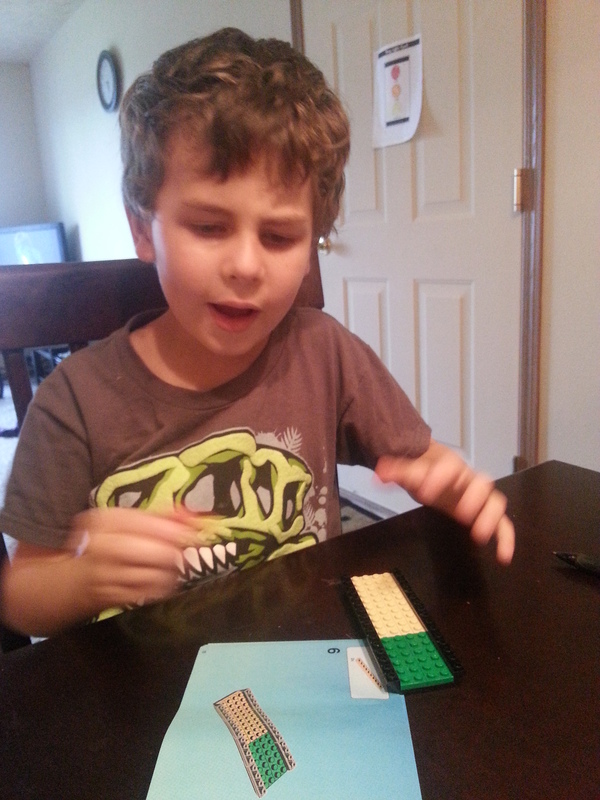 I am really impressed with how much his numerals are improving and how much attention he paid to how I formed mine. After that he wanted to make letters for me to copy and we did a page of those, and many of his capital letters are quite clear at this point too. An amazing fact, he can almost spell my name! 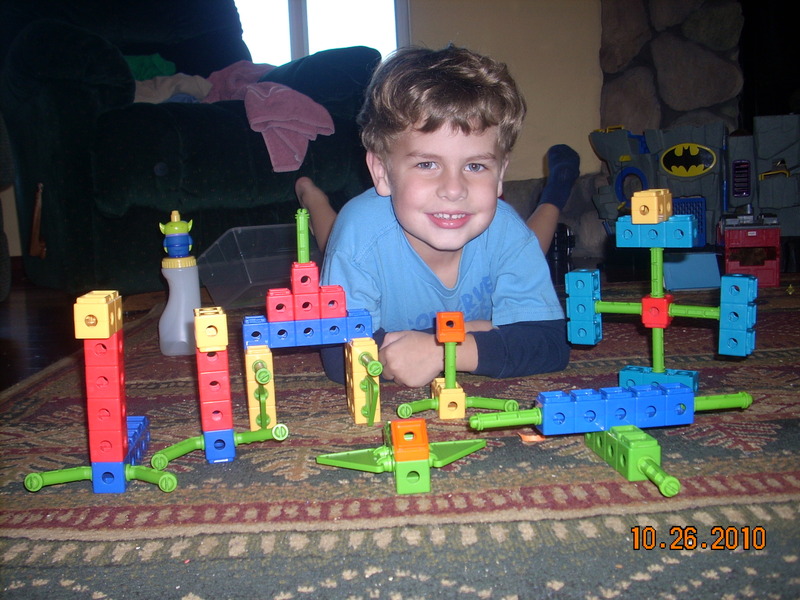 After we were done with Momma Directed School he chose to do a couple of mazes (from Kumon). There is a spot at the top for his name, he wrote his name and then below it wrote two letters mine!! The first and third, but I had no hint he had any idea how to spell my name. 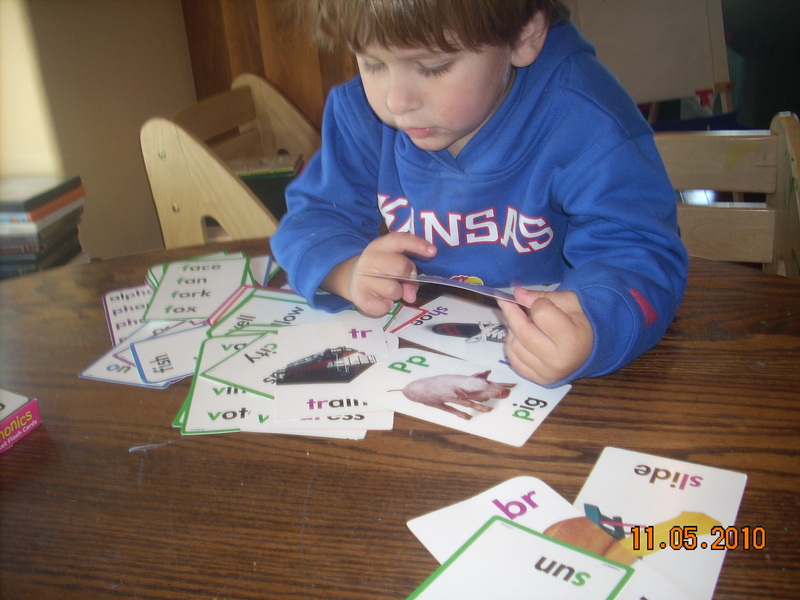 While Big Brother and I did math, and a few letters, Little Brother played with a desk of phonics flashcards. Mainly shoving them in front of my face with great glee as I was trying to write a number or letter for Big Brother. Little Brother already know several of his phonics sounds (V, K, S and others) mainly I think thanks to the boys watching The Letter Factory by Leapfrog in the van so much. I head him mimicking the DVD frequently. … life with a couple of pre-schoolers in the home? Today we did math work. 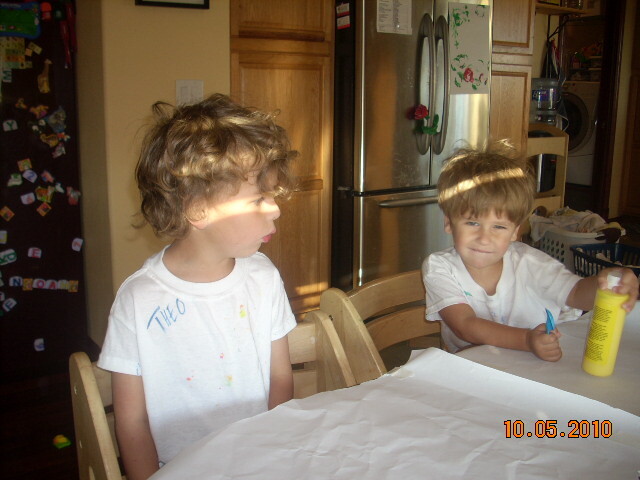 Big Brother has a lot of math skills, he can recite math facts and “talks” math a lot. However he is now at a point he is limited by his ability, or lack there of, to write numerals; so we have started doing more of that. 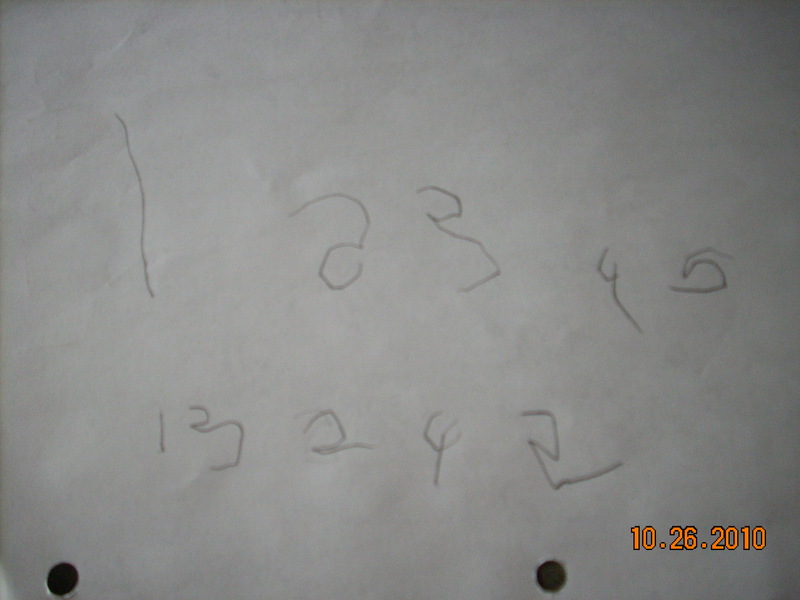 Today he did 2 sheets of math – one counting and the other adding, and he also copied the numerals 1 to 5 (copied momma). 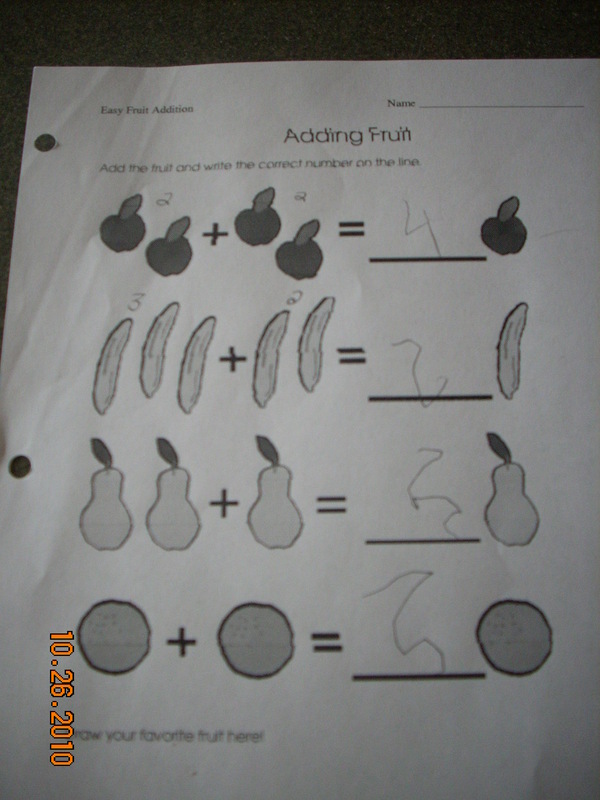 He also did some tracing and some “what comes next” pages too – his choice (momma suggested the math, but he did agree). Fire art today meant play dough. Big Brother’s request. Big Brother worked for over 100 minutes. Little Brother played and left and came back and left again; his attention span is not there; nor his skill. 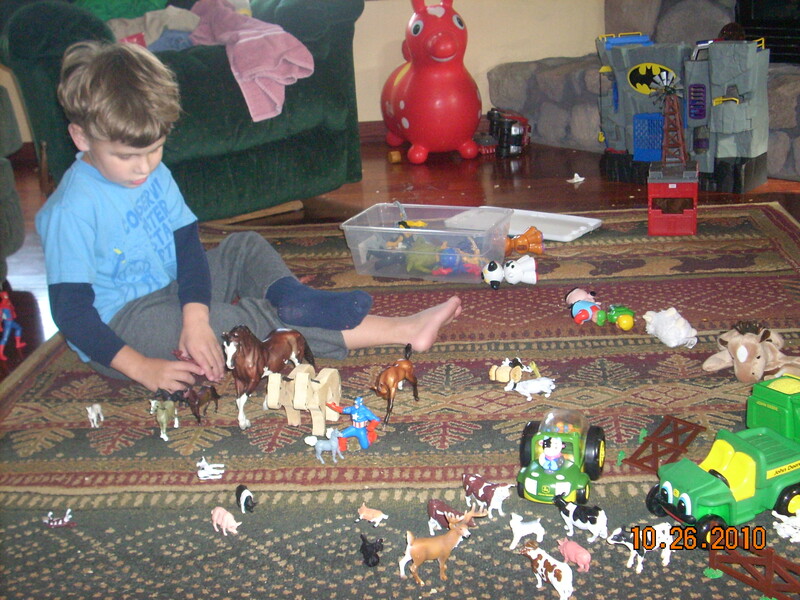 Creative play today was FARM.. I was thinking the other day we’d not had the farm out in a while and today Big Brother asked for it—wow. They boys don’t do a lot of pretend play; they set them up, they knock them down, I set them up and then they knock them down. Repeat, repeat, repeat. Not a lot of interaction. Today Big Brother did use the people and make then “animal rescuers” and “animal doctors”. Big Brother would tell me to report missing animals to him, so any animal not on the rug I’d report. The most amazing thing might have been clean up. 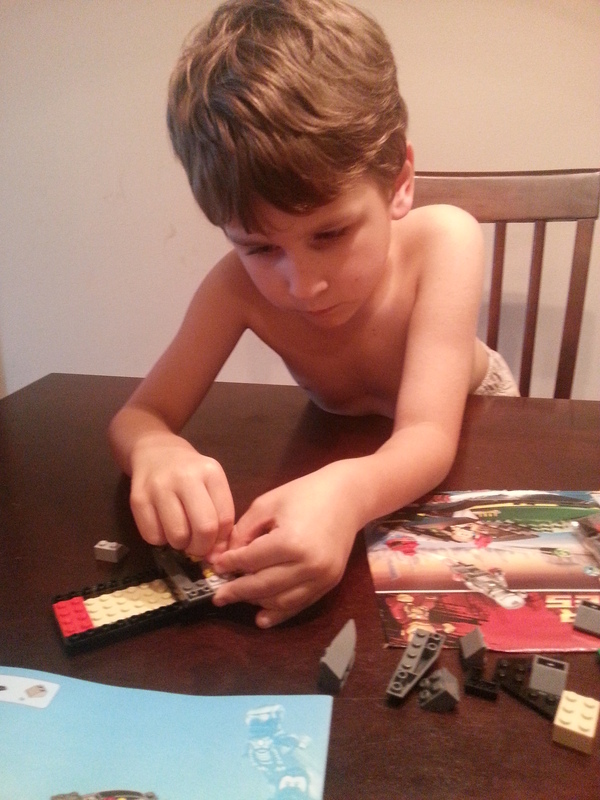 There are a lot of pieces so I jumped in to help, Little Brother got right there and as picking up things and dropping them in the tubbie; no really effort on my part to encourage or direct him. Big Brother is getting really good at looking under the sofa and so on for missing items before calling all clean too. Big Brother made more robots today; and the photo of Little Brother on my back were taken by Big Brother. Pigs Ahoy. Lib book. I think I liked it more than the boys. Fidgety Fish and Friends. Lib book. This is Little Brotehr FAV book. he loooves it. I do not get to read it, just yell out the item Little Brother is pointing at. He really likes the bubbles and jelly fish. It is a really cute book. Barnyard Big Top, Lib book. maybe beyond the boys, you have to look at the pictures to see the humor in the text and netierh seemsed to get it. Little Brother loved the pig though. 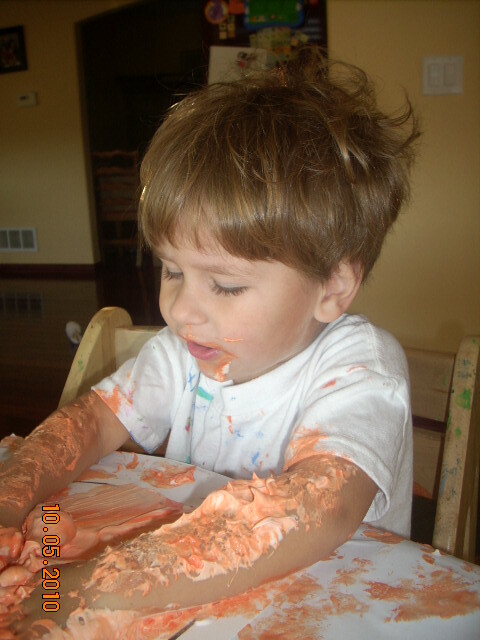 The Boys and I enjoyed fall themed puff paint today. ﻿Puff Paint is a fav here; ﻿we first did Puff paint last Easter this time we did apples and pumpkins to use to decorate for our party this weekend. The original idea i found had glitter, and no color. A very simple project that looks a lot messier than it really is. 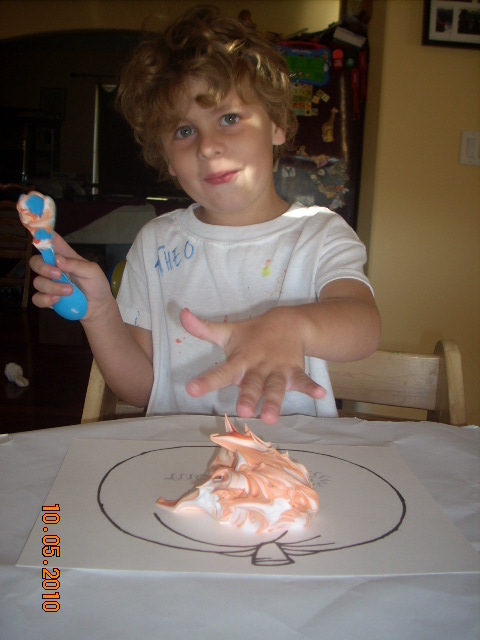 Shaving cream cleans up very easy. 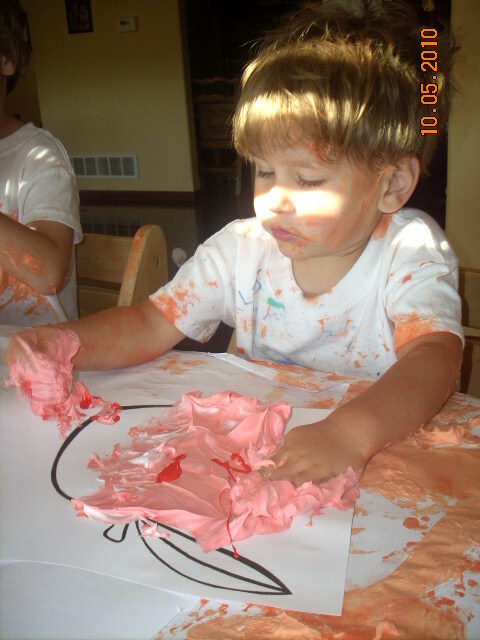 take equal part shaving cream and plain school glue and mix — you can add the color any time. 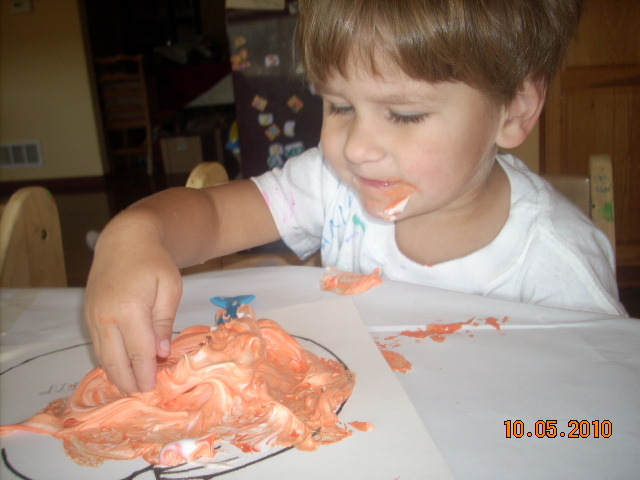 I mix the glue and shaving cream first so that i can swirl the color in and not have to over mix the paint. That allows for a variety of the color and i personally think the swirls and variation in the color add a lot to the project. 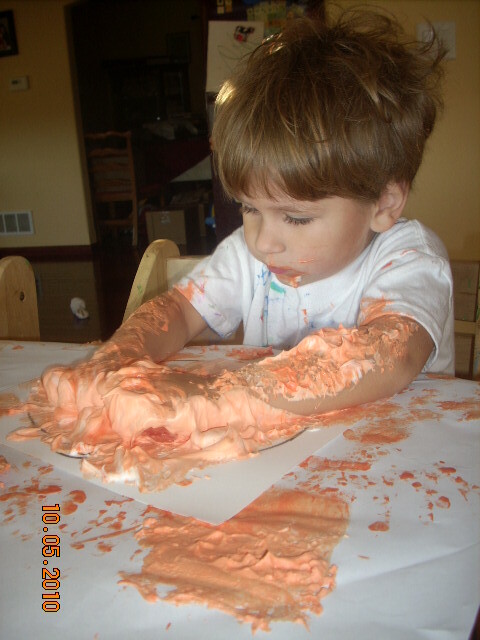 If you can keep your child from “over smoothing” the colored cream mix you can get a really cool puffy product when it is dry. 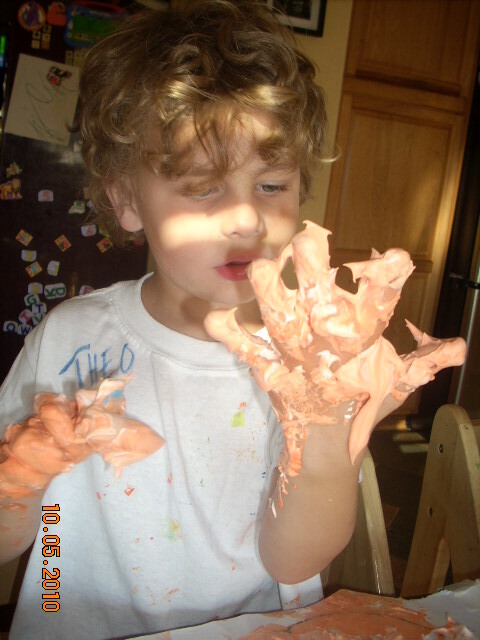 My boys are more into the “finger painting” aspect and tend to over-work the piece. You can leave the pint cream mixture in a bowl and let your child spoon it out on their own, but my boys don’t have the skill really for that. I mix the mixture (4 times today) in a bowl and then glop piles into the middle of their picture. 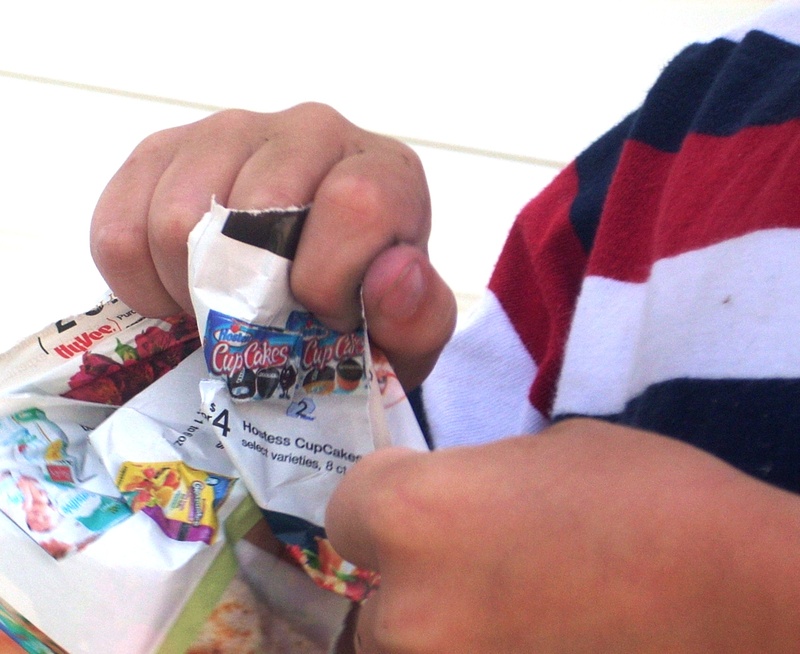 Then the boys can use their plastic spoons or their hands to spread out the mixture. I try to encourage using the spook, just to practice using a to ol, but they like their hands. 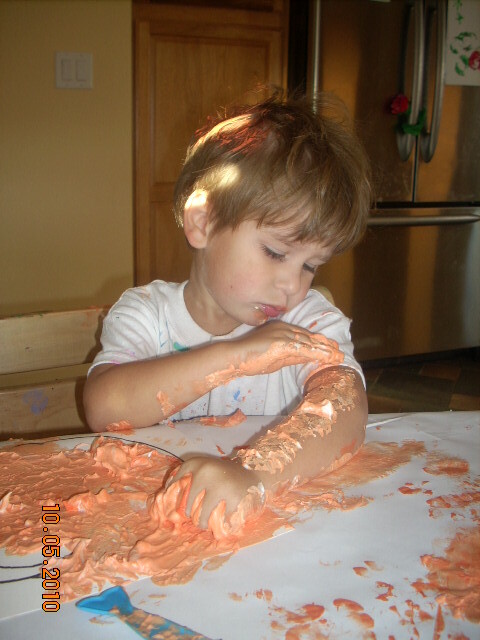 This is a great sensory project, Big Brother as a little boy (1 to 2) did not like to get his hands messy (no concern about the rest of him — inf act played in the mud a lot coming to me to clean his hands, his face covered) and would not have gotten near this. 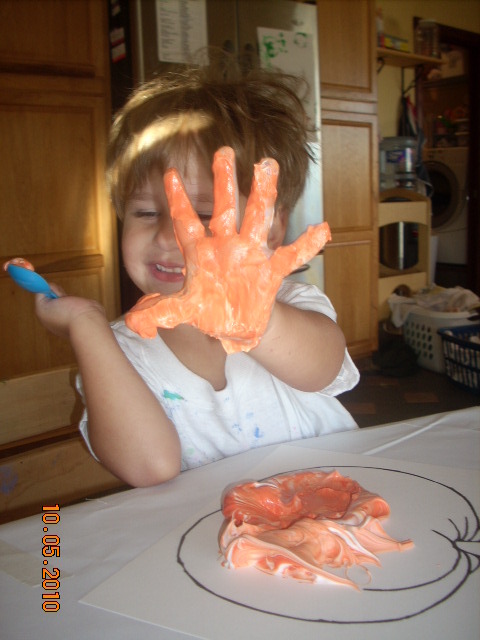 His 2nd Easter his Daddy and I tried to finger paint with him and he refused to paint at all and cried. 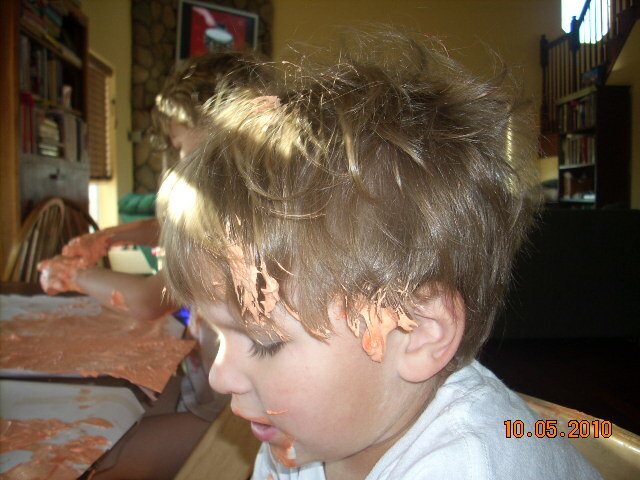 Now, however, he loves messes and Little Brother has ne ver had an issue with it. Our next project is going to be fall leaves and i am going to give them 2 colors at a time. or mabe put 2 colors in the mix at once and simply not stir — not sure yet. I would also like to find a way to make the mixture stiffer or add texture to it. It is all about the expereince!!! 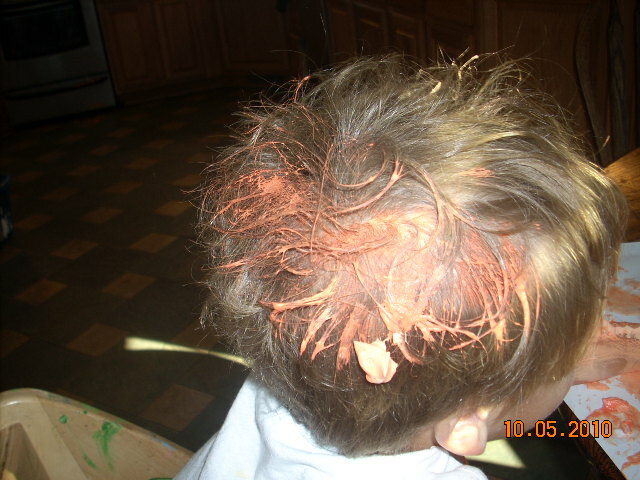 Little Brother had it in his hair, both sides. He had on his face (did he taste it? I think so). He covered his arms intentionally. Both boys explored it as they smushed it in their hands and felt it start to get sticky.